He Pushed A Teen Onto A Train Track Fled Scene And Died! 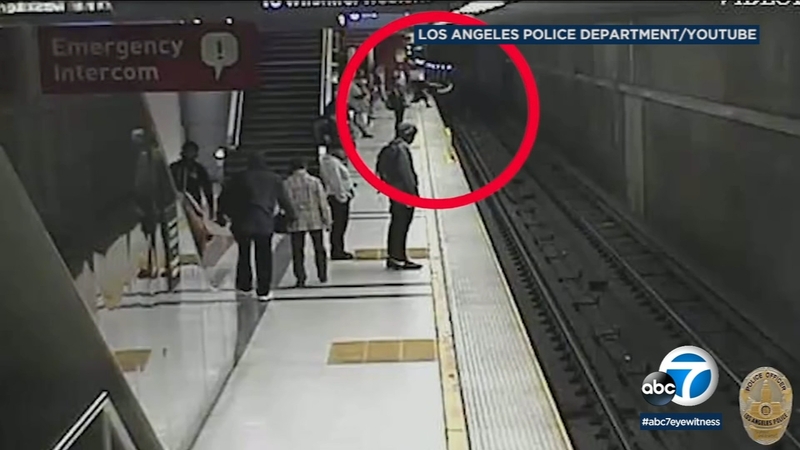 Los Angeles police on Monday released surveillance, bodycam and cellphone videos in connection with a man who died in December for undetermined reasons after he allegedly pushed a boy onto a train track and attacked a construction worker in downtown Los Angeles. Husie Outing III, a 47-year-old L.A. man, died in a hospital about an hour after police detained him at Pershing Square the day of Dec. 19, according to LAPD. The agency said officers responded to the scene after receiving a radio call about an incident on Fifth and Flower streets at around 9:30 a.m. Witnesses said in an unprovoked attack, Outing tackled a 14-year-old boy on a platform at Metro’s Pershing Square Station. After both of them ended up on the train tracks, bystanders helped the teen up. Outing climbed back to the platform on his own, LAPD said. The agency released surveillance footage from the station showing two people falling onto the tracks and making it back to the platform some time before a train arrived. LAPD also provided footage of Outing walking up the stairs at Pershing Square, apparently trying to flee the station. That’s when he allegedly assaulted a construction worker. Cellphone and bodycam videos show four men holding down Outing before officers arrived and handcuffed him. At least one of the officers threatens to Tase Outing but does not appear to do so. “He’s strong,” an officer is heard saying. Police are also heard calling for an ambulance and indicating that Outing had injuries on his head and hand. The man appears uncommunicative throughout the encounter. On the day of the incident, Detective Meghan Aguilar described the officers’ use of force as minor. “Minor use of force would be something not lethal, no beanbag, no Taser. Sometimes it’s just a firm grip on a body part,” she said. Footage shows paramedics eventually arriving and placing Outing into an ambulance. The county Department of Medical Examiner-Coroner has yet to announce the cause of death pending the results of toxicology tests, according to authorities. The 14-year-old was treated for minor injuries and released at the scene. The construction worker Outing allegedly attacked sustained abrasions and lacerations on his leg and face. He later sought medical treatment for his injuries, officials said. According to LAPD, Outing had no prior contact with the agency’s Mental Evaluation Unit. He did have a criminal history that included assault with a deadly weapon, resisting arrest, battery, possession of a controlled substance and voluntary manslaughter, police said. Officials said the incident, including the officers’ actions, remained under investigation.